For two hours each evening, an Ivanka Trump lookalike has been vacuuming a hot pink carpet at the Flashpoint Gallery in Washington, D.C.
As she appears to be on the cusp of completing the task, spectators soil the carpet with bread crumbs. She vacuums them up. The audience tosses more crumbs onto the carpet. The pattern repeats itself. Jennifer Rubell’s installation, titled “Ivanka Vacuuming,” has already elicited a response from the subject. As a historian of contemporary art, I wanted to learn more about this headline-grabbing work. So I followed Rubell’s directive and saw it myself. The piece certainly pops: It’s pink. Very pink. And the Ivanka double has a plastic sheen that borders on surreal. It took a moment to adjust to the saccharine visuals. But it soon became apparent that Rubell was drawing from a rich tradition of performance art. She seems to be compelling viewers to think about the huge numbers of women who perform invisible labor – all in exchange for a few crumbs from the great American pie. The work of art has been staged at the back of the gallery, in a space surrounded by three white walls. In the foreground, there’s a white cube, approximately three-and-a-half feet high and topped with a two-foot mound of Panko bread crumbs. Text invites the viewers to scatter the crumbs onto the pink carpet to keep the Ivanka doppelgänger busy. Fortunately, the night I visited, Rubell was in the gallery observing the performance. She told me that she has witnessed the live performance in Washington, D.C., a few times. Otherwise, she’s been watching it on a live feed from her home in New York City. Artist Jennifer Rubell’s work has already elicited a response from her subject, Ivanka Trump. The Ivanka lookalike is a model whom Rubell hired through an agency. In my brief conversation with Rubell, she mentioned that although she had to make some minor adjustments to the model’s hair color and makeup, it was relative easy to mimic Ivanka’s look because she is already so doll-like. Rubell cited pioneering performance artist Vito Acconci as an inspiration for her interest in the medium. You can see his stamp on “Ivanka Vacuuming” in works like “Step Piece.” Over a performance period of one month in 1970, Acconci documented himself, each day, stepping on and off a stool in his apartment at the rate of 30 steps per minute until he was unable to continue. He wanted to highlight the absurdity of certain repetitive tasks. In her work, Rubell is also tackling the seeming endlessness of mind-numbing labor. But she’s doing it in a way that aligns herself with artists such as Judy Chicago and Miriam Schapiro, who co-founded the California Institute of Arts’ Feminist Art program. In 1972, Chicago and Schapiro collaborated with other feminists to create installations, performances and discussion groups concerned with the invisible labor performed by women, especially in the home. 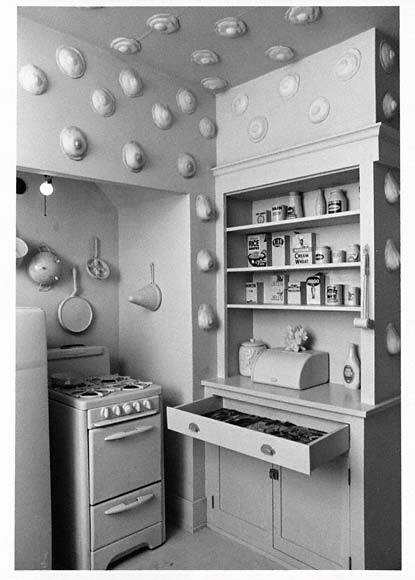 Titled “Womanhouse,” this influential exhibition criticized prevailing attitudes towards femininity and domesticity that had been instilled through a range of cultural messages, from advertisements for home appliances, to toys like the Barbie doll. The Getty Research Institute, 2000.M.43.1. The exhibition was set up in a dilapidated Los Angeles mansion. A group of 23 artists refurbished the residence prior to installing their work to make the familiar spaces of the home seem strange. For instance, the walls of the kitchen were pockmarked with fried egg sculptures that resembled eyes or breasts, while the shelves of a linen closet were merged into the body of a life-size mannequin doll. In “Ivanka Vacuuming,” I also see echoes of New York-based artist Mierle Laderman Ukeles. In 1973, Ukeles got down on her hands and knees to scrub the floors and steps of the Wadsworth Atheneum museum. In another famous work, Ukeles shook the hand of every New York City sanitation worker. Like “Ivanka Vacuuming” and “Womanhouse,” Ukeles wanted to bring attention to the drudgery of everyday tasks that are crucial to our well-being but go largely unrecognized and unrewarded. There’s a twist to “Ivanka Vacuuming,” however: It requires audience participation. In order to complete the work, viewers must grab from the pile of crumbs sitting on an abstract cube in the darkened half of the gallery and toss them into the brightly lit performance space. Audience members are invited to make a mess – and then grapple with what it feels like to have someone else clean it up. Rubell’s invitation to viewers made me think of Yoko Ono’s famous “Cut Piece” from 1964. In it, Ono sat on the floor with her legs folded beneath her body and a pair of scissors by her side. Viewers were invited to approach the artist, one by one, and cut off a piece of her dress. The performance continued until the artist was almost naked. I was also reminded of the 1990 work “Untitled (USA Today),” in which artist Felix Gonzalez-Torres piled a large mound of candy wrapped in red, blue and silver foil against the corner of a gallery and invited visitors to help themselves. Torres was prompting the viewer to think critically about the sugary news dished out by mainstream newspapers like USA Today and the way many readers uncritically gobble it up. Rubell’s work likewise, challenges her audience to engage and to think critically. Vacuuming isn’t inherently degrading or abject. But it’s difficult to imagine Ivanka, at any point in her privileged upbringing, wielding a vacuum. The artwork is jolting in the way that it juxtaposes Ivanka’s public image – pristine, professional, camera-ready – with tasks performed by the maids and housekeepers who labor in Trump’s homes, hotels and resorts. But Rubell slyly subverts the dynamics of control. Who’s in charge? Is it the wealthiest one percent whose needs power the vacuums, start up the hotel laundries every night and turn on the kitchen fryers at 4 a.m.? Or, perhaps it’s us – the public, the spectator – who keep the crumbs coming, participating in a system that privileges the few at the expense of the many. Preminda Jacob does not work for, consult, own shares in or receive funding from any company or organisation that would benefit from this article, and has disclosed no relevant affiliations beyond their academic appointment.